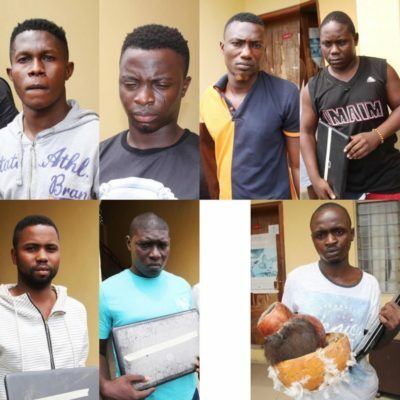 EFCC has arrested 7 National Diploma (ND) students of the Moshood Abiola Polytechnic (MAPOLY), Abeokuta, Ogun State, for alleged offenses bordering on conspiracy, obtaining money under false pretenses and possession of forged documents. They were arrested alongside Iyun Ifeoluwa, Odusanwo Ibrahim, Obanijesu Opeyemi Soneye, Azeez Olayinka, Babatunde Ajala, Ojejimi Ademola, Aderowunmi Ayomide and Oluokun Oluwaseun on August 17, 2016, following a petition received about their activities. One of the suspects, Olaseni, a 21-year-old Business Administration student, was said to have created a Facebook account with the name Dean Robert, with which he interacted with his victims. A number of items, including laptops, forged documents, were recovered from the suspects during their arrests.